Racing videogame enthusiasts have a long history of DIY innovation when it comes to their driving setups. While there are many many good wheels out there, there aren't many multi-speed shifters that can be found at an affordable price. For this reason, a lot of people build their own. Any YouTube search for "H Shifter" will show that there are as many different kinds of shifter out there as there are racers. This page is intended to compile the various programs you can use with a homemade h-shifter, as they can sometimes be difficult to locate quickly. These are all free programs. Feel free to bookmark and come back any time. We're not going anywhere. I've had this webspace since 1998 (no kidding), so don't expect it to 404 anytime soon. All files are hosted here, so they'll continue to be here too. To download these files, you may need to right click and choose "Save Target As" ("Save Link As" in Firefox). From the original site: "Virtual H-Shifter is a program that enables you to use your Joystick as shifter like in a real car(you can see Joy H-Shifter made by Gaas). How is it working: program sends keystrokes to your game when you put joystick in position of some gear.". Of course, most of the links are dead now. Essentially, the program sends keyboard keys to the game, or even Notepad, (like Joy2Key) in response to joystick input. FFShifter, by Andreas Panos, is another joystick to keyboard program, except it is only compatible with force feedback joysticks. It comes from the now-defunct rscnet.org forums. Xpadder 5.3 is the program I currently use. I haven't tried the others yet, because this one seems to suit my needs perfectly. It has adjustable and rotatable joystick "shift" zones, and a visually adjustable deadzone "bullseye" that allows you to make it as large as you wish. This allows the game to ignore all input for the stick until it's been fully shifted into a particular gear, preventing accidental shifts, and preserving the realistic feel. The other apps may offer the same level of control, but again, I haven't tried them yet. Xpadder is now a paid program. This is the origiinal free version, which is freely available. I've also included my (4-speed) profile and controller file for XPadder. I have no idea if they're of any use to anyone but me. Above, you can see the main XPadder screen on the left. The numbers indicate keyboard keys 1, 2, 3, & 4, which I have set up as gears 1-4. The program sends no data unless the stick physically enters one of those squares. 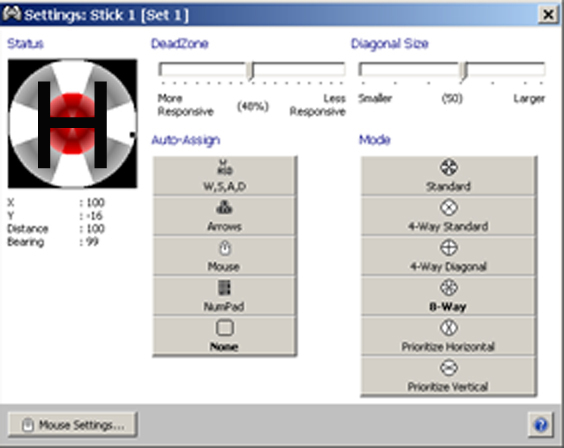 On the right, you can see the XPadder Settings screen, where you can choose how many zones the program will recognize. In my setup, only the 4 gray zones are recognized as being "in gear". The red circle is the adjustable deadzone, which can be made as large as you like. Below, you can see the same screen, with a letter H roughly superimposed, to give an idea of how the zones work. Since the the zones can be shifted and resized, this gives you some breathing room when you cut the H for your controller, in case it doesn't come out the exact size you intended. Kane is a Chinese gent, who created this program and has a couple videos up on YouTube. Normally, you have to message or email him to request the program, but he has ceased responding to YouTube messages. With this in mind, I have provided it here. If the author would like to request it removed, please email me at the address below. AL Shifter is different from the other programs in that it accepts button input from a joystick or thumbpad, rather than actual X/Y analog stick input. It is actually a proprietary program created by ActLabs for their line of USB H-Shifters (which unfortunately don't appear to be available for sale anymore, except as part of a wheel). With an easy registry hack, it can be made compatible with any joystick controller. This is perfect for people who prefer to build an H-shifter with individual switches for gears, as they can wire jumpers to the buttons on any cheap gamepad and use this program. The AL Shifter program also has pre-made profiles for many popular racing games. The instructions for the hack are found here (I recommend right clicking and doing "save as" to download, as it's much less of a headache to read in Notepad with "Word Wrap" turned on). The AL Shifter hack and info comes from this page, which is very much alive and has details on building a really awesome and sturdy H-Shifter. You should visit it. It's my understanding that some of the dedicated shifter programs above include their own "gear grinding" sound effect for when you shift. If you find that this sound grinds your gears, I've read that the solution is making a blank (mute) soundfile with the same filename, and substituting the original audio file with that. You should be able to make one with Windows Sound Recorder or Audacity (free). I should point out that I was originally inspired to build my own 4-speed H-Shifter when I recently learned that Sega's Daytona USA had finally been emulated successfully on the Model 2 Emulator, with FORCE FEEDBACK! The shifter was the last missing piece for an arcade-perfect Daytona experience (as I already have the Logitech Driving Force Pro, and Playseats Classic racing seat). If, like me, you've been living under a rock for the past 2 years and didn't know that it was finally emulated, consider this my gift to you. Now go download it, and enjoy some "Daaaaaaaayyyyytoooooonnaaaaaaaaaaaaaaaaa!!!!!!" If you have any questions, comments, advice or corrections, please email me at "billkwando" [at] "yahoo.com". If by any chance you're also interested in knowing how to use Rock Band/Guitar Hero instruments on the PC, you can visit my other page about that here.